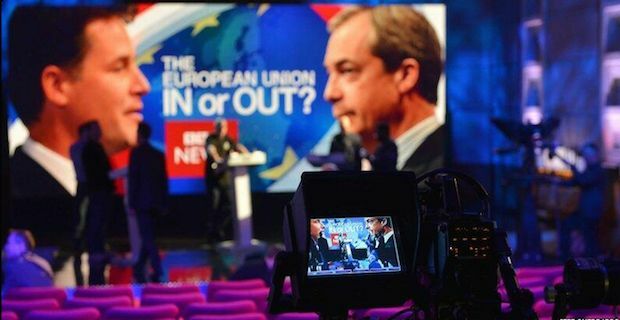 In a tense and testy debate televised live on BBC last night, Nick Clegg and Nigel Farage went toe to toe over EU membership. The battle was heated and lasted for a full hour with host David Dimbleby having to work hard to keep the two on track at times. Lib Dem leader Nick Clegg started strong by claiming that Farage's idea of a UK separate from the EU would leave the UK in an isolated position as a "Billy No Mates Britain". Clegg argued that the UK needed to remain in the EU "because that is how we protect the Britain we love". UKIP leader Nigel Farage was well up for the debate however and went straight onto the offensive stating that immigration has impacted on UK wages by as much as 14% since 2007. He argued that ordinary citizens were the one suffering saying "It's good for the rich because it's cheaper nannies and cheaper chauffeurs and cheaper gardeners but it's bad news for ordinary Britons.". Throughout the debate, Farage and Clegg presented their opposing visions of what remaining and leaving the EU would mean for the UK. Snap polls following the debate suggest that Farage was the victor on the night but a senior Lib Dem aide suggested that the debate was very worthwhile as it offered Clegg the opportunity to speak directly to millions of people who "believe in Britain being in Europe.". Prime Minister David Cameron promised a referendum on Europe over a year ago but both he and Labour leader Ed Miliband declined to participate in last night's debate.